PRO EYEVISION, a unique product for eyes, contains a complete set of vitamins, minerals, and anti-oxidants that Your eyes truly need. Pro Eyevision contains a number of bioactive and the most essential, cleanest and most absorbent substances such as bioactive vitamin C (L-ascorbyl-6-palmitate), zinc bisglycinate, selenomethionine, some of the most potent antioxidants such as ataxanthin, zeaxanthin, lutein, and several other substances necessary for the normal functioning of eyes. A UNIQUE COMBINATION OF EYE VITAMINS AND MINERALS THAT YOUR EYES NEED! Eye health should not be taken for granted. A variety of different studies show over and over again that with no proper support, eye health decreases with age. Fortunately, there are studies conducted by the US national institutes of health and the National Eye Institute, which contain a number of evidence-based materials about eye health and age (Age-Related Eye Diseases AREDS-2). Three effective nutrients, such as lutein, astaxanthin and zeaxanthin, have been found to not only protect the health of the eyes, but also help to improve vision by keeping it good. 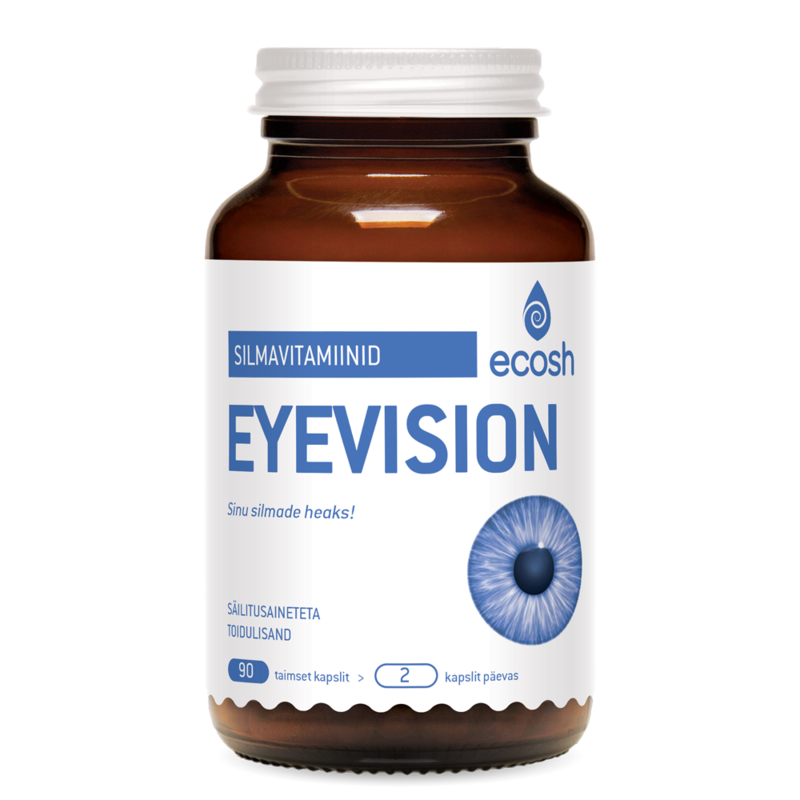 To keep your eyes healthy and sharp, Ecosh has created a special product for your eyes that contains a complete set of antioxidant vitamins and important trace elements that your eyes really need to function properly. Vitamin A is important in the seeing process as it helps to maintain photopigment. Vitamin A also helps to produce lutein and zeaxanthin, which are eye-protecting pigments that protect eyes from harmful ultraviolet rays, and also helps to keep the eyes moist. Vitamin C supports the normal health of the retina, lenses and the blood vessels of the eyes. (Reduces vascular permeability). Vitamin E acts as a protective wall in the cell-membrane of the eye that prevents oxidation processes. Vitamin E in turn absorbs better thanks to the trace element selenium. Selenium is an antioxidant that also promotes the development of capillaries and supports blood circulation. Zinc is the most concentrated mineral in the eye, which supports the whole function of the retina and blood vessels. Zinc ensures the anti-oxidant protection of the photopigment and participates in the seeing process. Lutein and zeaxanthin – the macula is yellow (its colour is given by lutein and zeaxanthin) as it adsorbs blue and ultraviolet light that enters the eye, thus protecting the eye from ultraviolet light (works like sunglasses), whereas zeaxanthin dominates in the macula and lutein elsewhere in the retina. Astaxanthin protects eyes from damages caused by inflammation and light and helps reduce eye fatigue, itchiness, and dryness. NB! This is great news for those who work on a computer every day. Ingredients: Vitamin A (as retinyl palmitate), vitamin C (as ascorbic acid and L-ascorbyl-6-palmitate), vitamin E (as D-alpha-tocopheryl acid succinate), zinc (as zinc bisglycinate), selenium (as selenomethionine), lutein, astaxanthin, zeaxanthin, bulking agent: organic rice flour, vegetable capsule: hydroxylpropyl methylcellulose. NB! The product does not contain any harmful compounds. The bulking agent is organic rice flour. The product has no GMOs, artificial flavours, or colouring, and is lactose and gluten-free. Also suitable for vegans. Directions: 2 capsules a day with balanced food, according to the recommendation of a therapist or a doctor. For children, 1 capsule. Take with water. The recommended dose should not be exceeded. Consult doctor or therapist if you are taking medicines. A dietary supplement does not replace a diverse and balanced diet and a healthy lifestyle. Keep out of the reach of children. Product Quantity: 90 vegetable capsules, 500 mg capsules, net weight of 45g.